The Mongol queens of the thirteenth century ruled the greatest empire the world has ever known. Yet sometime near the end of the century, censors cut a section from The Secret History of the Mongols, leaving a single tantalizing quote from Genghis Khan: “Let us reward our female offspring.” Only this hint of a father’s legacy for his daughters remained of a much larger story. creating an economic system that stretched from the Pacific to the Mediterranean. Outlandish stories of these powerful queens trickled out of the empire, shocking the citizens of Europe and the Islamic world. At the conclusion of his magnificently researched and groundbreaking narrative, Jack Weatherford notes that the deeds of these Mongol queens inspired great artists from Chaucer and Milton to Goethe and Puccini, and so their stories live on today. 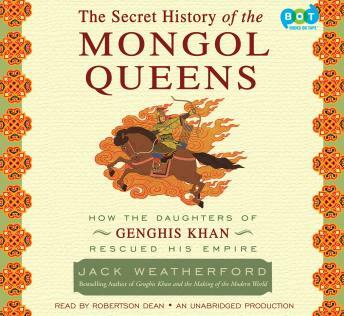 With The Secret History of the Mongol Queens, Weatherford restores the queens’ missing chapter to the annals of history.